She is a welcome sight on one of the most remote postal routes in the country. 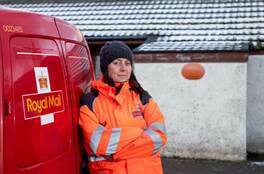 Postwoman Michelle McCulloch serves the UK’s most northerly route. Approximately 212 miles from John O’Groats, the Haroldswick area of Unst in the Shetland Isles is one of the most northerly points in the UK – and certainly the most remote Royal Mail postal route. The mail on the route, which stretches from Baltasound Post Office to Norwick, is delivered to Unst every day via ferry from the mainland. The daily postal load travels 57 miles in total – taking two ferry rides before it makes its way into Michelle’s capable hands – which she delivers to the community by both van and foot. The 30-mile route crosses a host of stunning beauty spots and points of interest, including a still-to-be-built space centre, and the UK’s most northerly Post Office. Having served the route for more than 15 years, Michelle is a pillar of the local community. She provides a lifeline service for which the islanders are grateful. Michelle said: “As such a remote community, the post is definitely a lifeline to the people of Unst, and it’s lovely to be the person that delivers it to them. There are just over 200 houses on my route (about 650 people overall), and one of the best parts of the job is that you get to know everyone so well. There’s such a warm community feel on the island, and I always feel like the people I deliver to are genuinely pleased to see me. “Lots of people on my route are personal friends, and as it’s such a small island you certainly know 99 per cent of the people you meet. You occasionally get newbies, but we always make sure they feel welcome very quickly. No chatting, you'll be going over!! Even better bet she's never seen a dominos d2d.